Many self-employed, small and medium-sized enterprises have recognized the increasing importance of search engine marketing. The high relevance of paid search results in the form of text ads increases the number of clicks and the associated traffic on the website. Qualified traffic then increases sales and profits. Google Shopping (formerly Product Listing Ads (PLA)) are especially for shops relevant forms of advertising. Check the deep links: Are really all pages accessible? Check the conversion rate of your ad texts: Are really all parameters in the green area and are the ad texts up to date? If the specified budget is sufficient, or your campaigns reach the budget limits on delivery. Are you satisfied with your positions or are you on positions that don’t really bring you anything, so no traffic? Then you need to optimize your campaigns. *Further tips are available on request. Online Digital X has nearly 15 years of experience in search engine marketing (SEM) with the search engines Google (we are Adwords certified), Yahoo and MSN. The market for mobile devices, i.e. smartphones, is growing very strongly. Devices such as the iPhone, Blackberry or iPad can be ideally promoted with online marketing campaigns targeted at these mobile devices. SEA as direct response marketing is best suited for sales of your products. With an SEA campaign that is constantly optimized, it is guaranteed that you can increase your sales with optimal budget utilization. Because Google Adwords is based on CPC billing, cost per click, your budget is only used when a potential customer clicks on your ad. Impressions, e.g. of your telephone number, are free of charge. Ongoing optimization and control is daily business; the econda Site Monitor gives you immediate insight into the current campaign at any time. Values such as CPO (Cost per Order) or CPC (Cost per Click) can be recognized at a glance. Our remuneration model is very simple: Based on your budget we receive a management fee, which we agree with you individually. Performance-related compensation models are of course also possible. Use of AI bid management system if desired. The management fee includes account management, optimization, reporting, tracking analysis and consulting. Microsoft’s search engine is becoming increasingly important. Especially for niche services and products, it pays to run campaigns on the Bing search engine, sometimes with a very high return on investment (ROI). If you are also interested in advertising your products and services on Bing, let us advise you. 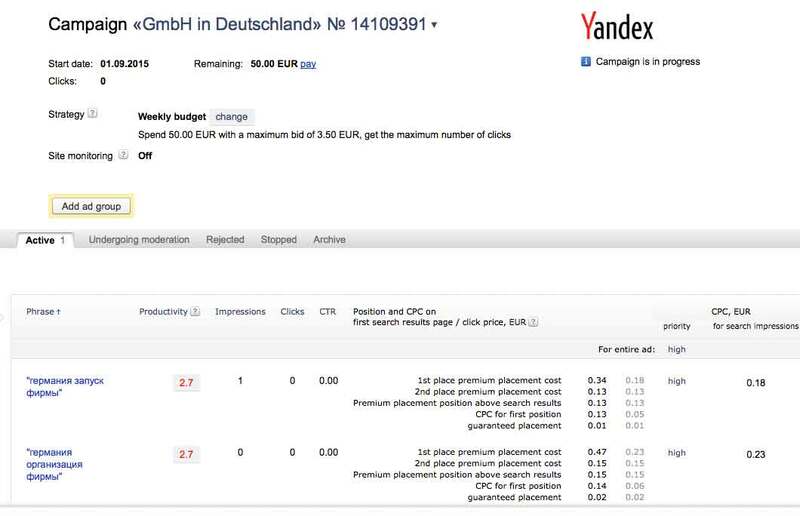 Especially for our international customers, who also focus on Russia, it is worthwhile to run high-performance campaigns in Russia on the Russian search engine Yandex. If you are also interested in promoting your products and services on Yandex, let us advise you. Similar to the Google Merchant Center, there is the possibility to advertise your products directly on Amazon. We regulate and optimise the daily budget and click prices. You would not have to offer your products for sale via Amazon. 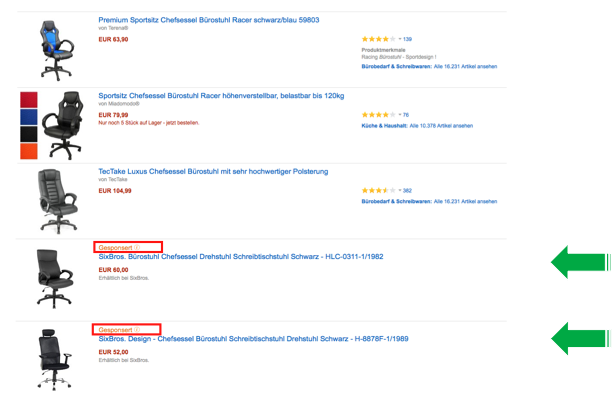 The products are advertised on Amazon on a product and keyword basis. Your advantage, only the actual click is calculated. The cost-per-click, as well as the daily budget will be agreed with you in advance. Thus the media budget, similar to Google Adwords, can be used optimally. If you are interested in placing your products in Amazon’s product ads, please contact us. This product is no longer available. We would be happy to advise you on alternatives. We book CPC and CPM campaigns for you in premium networks that give your online shop the decisive kick for qualified traffic. Through our bookings with direct marketers you have the opportunity to receive significantly more traffic on your website for your advertising expenses. Our network offers unique opportunities that enable our customers to make more profit. Our bookings in the CPC and CPM area are delivered exclusively on AGOF-certified websites. Mobile advertising is gaining more and more importance due to the increase of smartphones. We are able to switch mobile ads to your desired target group quickly and at short notice. Whether iPhone, iPad or Blackberry, your advertising can be placed precisely to your target group. In some cases, more search queries are already made via mobile devices than via desktop computers. You have had an app created for your company. But the download numbers are low, only a few reviews are published. Interest is rather low. We provide the necessary visibility in the download charts. It does not matter whether it is a free or paid app. We can push your app to give you download, reviews and visibility. Our advertising turns your app into a highlight! We place targeted ads in apps for Android and iOS smartphones. This allows you to efficiently reach your target group. The smartphone market continues to grow considerably every year. are even more interested in your product from a target group that has become aware of you. Make full use of the potential of mobile advertising!